ALL SET FOR THE 4th HFT PH (118th) INDEPENDENCE DAY PARADE ON SATURDAY, JUNE 04,2016; MORE ORGANIZATIONS JOINS THE PARADE. Los Angeles—Mabuhay ang Ika-118 Araw ng Kalayaan ng Pilipinas! As of the press time, 32 organizations have joined the 4th HFT PH (118th) Independence Day Committee (4HFTIDC) that organized the parade and program on June 04, 2015. The committee is inviting other organizations to join the 4th Historic Filipinotown parade on Saturday, June 4, 2016 at 9:00 AM. The last assessment meeting of the 4HFTPIDC is on Tuesday, May 31, 2016 at 6:00 PM at the Filipino American Service Group Inc. (FASGI) House at 135 N.Parkview St.Los Angeles,CA 90026. Assembly time for vehicles, floats and contingents is at 8;00 at the assembly area in front of the Silver Lake Medical Center (SLMC), 1711 W.Temple St. Los Angeles, CA 90026. The vehicles, floats and contingents are requested to submit participation forms at the registration table at Burlington and Temple Street . It is first come first serve for organizations to line up from Bonnie Brae St to Union St at both sides. The parade will start promptly at 9;00 AM around the Historic Filipinotown with the Pinoy Harley Riders Club c/o Tony B Reyes and the Nilo Lazaro and his 15 man- band from San Diego leading the parade. FILAM INQUIRER, Historic Filipinotown Neighborhood Council (HFNC), Justice for Filipino American Veterans(JFAV). Knights of Rizal (KOR)-Historic Filipinotown Chapter Kabataang Makabayan Pro People Youth (KmB), Nilo Lazaro and Band, LAKAMBINI NG KALAYAAN 2016, Medical Mission c/o Dr. Erllinda Grey, National union of Journalists in the Philippines (NUJP)More than 30 -USAOutreach for Christian Fellowship (OCF),Office of Califonia Assemblyman Jimmy Gomez, District 51. Pinoy Harley Riders Club (PHRC), People’s Community Organization For Reform and Empowerment (People’s CORE), Pilipino Workers Center of Southern California(PWC-SC), Pangasinan Brotherhood-USA, Philippine Independence Day Foundation-Carson City, Search to Involve The Pilipino Americans (SIPA),Queen of Asia Pacific (QAP), Southern California Filipino Dental Society(SCFDS), San Carlos Association of Los Angeles (SCALA), SUNDAY JUMP, Sapphire Media Regency (SMR),Veterans Van c/o BAGYO and Vita Plus. The parade participation is free. But the organizers are not responsible and legally liable to any untoward incident that may happen during the Parade. Joining the Kalayaan Parade is the sole responsibility of individual and organizational participants. Participating groups must sign and submit their participation forms via email or at the day of the parade at the registration table on June 4, 2016 at the parade starting area. For more information please contact Bernie at FASGI at (213)497-9804 and Art at (323)640-4056 or email us at alpiegarcia@gmail.com. Also please visit our website at www.jfavusa.org for more details. I worked with Joe at the People’s CORE (Community Organization for Reform and Empowerment) for 7 years of my life. Joe hired me 3different times. I started out as CO (Community Organizer); I wasResource Development Person; was a member of the Board at one time and then became Project Coordinator. I often brought my baby to the office with me, working part time until I left P-CORE to be a Union Organizer and applied all the invaluable strategies I had learned from Joe to union organizing: his revolutionary organizing model that emphasized bottom-up people-centered needs assessment, a consistent practice of self-reflection and community feedback (Criticism-Self Criticism),connecting every struggle–from tobacco use to workers rights to roach-infested housing–to corporate greed, global concerns, and anti-imperialism, and always embedded with a solid socioeconomicpolitical analysis that called for real and lasting change. Joe’s community organizing model is one that every service provider community org in Filipinotown now emulates, but he is often not given his credit due because he shared his wide expanse of knowledge with everyone freely. The third time I came back to P-CORE was a bit different. I remember crying in his office with the big window–that overlooked Beverly Blvd.–,large pictures of his dog, Revo, and huge stuffed teddy bear, telling Joe that I was in a bad situation. He did not hesitate to tell me right then and there that I had a job at P-CORE if I wanted it. It had been 7 years since I had worked for him. I accepted his offer and worked for him for 3 more years. For myself and many who loved him, Joe was above all KIND. And so generous. The entire time I worked at P-CORE he paid for every staff member’s lunch almost everyday. And he saved me, more than once. It is because of Joe that I, a single mother and survivor of abuse was able to attain both my Bachelors and Masters degrees. As an educator, social justice informs everything I do–this has so much to do with Joe. It is also because of Joe’s support that I have raised a beautiful young man, my son Geronimo, who is now going off to college at UC Riverside. If you needed Joe, he was there. No question and no harsh judgement most of the time–if he did, his questions and judgement were critical and expansive, prodding you to ask deep, introspective questions that galvanized profound personal change. Yes, Joe made me cry more than once, but he also hugged me and told me he loved me. And I loved him too. He was one of the fathers I’ve collected over the years. I felt a connection to my lost family. And in many ways he was myfamily. Those first years at P-CORE, Tomeka, Joe, Al, and myself had lunch together every day. East/West Community Partnership and maintained under the People’s CORE and the umbrella organization of Asian stakeholders in LA organized by Joe, Alyansa ng Komunidad (Community Alliance) or AK. Joe really loved his clever acronyms. There was SI for social investigation, PO for people’s organization, PEPSI for preliminary economic political social investigation, and of course CORE. During those times at P-CORE, all the staff went to each of our family parties, and celebrated all of our birthdays together. We were very close. Joe took me to my first rally, spoke to me my first Tagalog words, and took me to eat my first Filipino food. Everywhere we went to eat in Filipinotown it seemed like everyone knew him and loved him. At first I thought they treated him like a kind of boss, don, or royalty. But later I realized that what I saw was a deep gratitude for a man who had most likely helped them in some way. And above all, he listened. As an organizer, counselor, boss and friend, Joe was an active listener. I think because he listened so well and with genuine concern, that people responded to him and respected him greatly. I wish I could have gone as planned but sometimes life intervenes on plans and I stayed home to care for my newborn son instead. I wish so much that I could’ve seen him before he passed on.To hughim again and tickle him (he enjoyed being tickled and would gigglewildly and jump away nimbly, laughing). I wish I could’ve taken morepictures with him and seen him dance again, switching his hips backand forth, while he smiled maniacally. Yes, Joe was hilarious, quirky, and idiosyncratic. He made everyone around him laugh and when he mentored you, you felt the world get smaller and you felt so special. He was an amazing, one-of-a-kind-once-in-a-lifetime man whoseinfluence was so far-reaching, whose inspiration still sparks socialchange here and abroad, and whose legacy lives forever.Good night, Joe–beautiful mentor, benefactor, revolutionary leader, boss, and friend. Another Memorial Day is upon us and I have to attend two ceremonies as part of my job. At one of the veterans’ memorial sites is a bronze plaque with the names of 80 survivors of the Bataan Death March who live in the area. My dad’s name is on it. I think of my dad – an Army man, through and through. The Army-Navy game every winter was the one football game he would never miss even though he didn’t have a stake in the game other than he was in the Army. Unlike other veterans he never talked about what he did during World War II or the Korean War. To this day he remains an enigma to me. So last week, out of curiosity, I Googled his name” Melchor V. Diokno. To my surprise I found a webpage about him and his service in the Philippine Scouts, an elite unit of the U.S. Army. His uniform is on display in a museum at the San Francisco Presidio. So, another chapter is filled in about a man who rarely talked about himself. Maybe it’s because no one asked him about his war experiences. I tried to get him to open up about his experiences in the military, but he would divert the conversation to something else. There are a few tidbits gathered through the years: Such as when he found his way home after being a POW, he was so emaciated, dirty and “smelly,” his daughter Benicia ran into the house because she didn’t recognize him. My mother also said that he was in charge of the grave detail of the POW camp. The POWs used the daily ritual of burying the dead as a means of escaping the camp. The prisoners would be hidden from the guards by placing the dead prisoners on top of them. When the guards were not looking, they would dash into the surrounding jungle. It seems the more I learn about him, the more questions are raised. Many of my nieces and nephews also knew another side of him. He had this ability to pull candy out of their ears. Sure, maybe they were humoring an old man but he took so much pleasure in their company and the surprised and delighted look on their faces when he would seemingly find candy in their ear. My father had hoped to continue his service but after being skipped over for promotion, he retired as a major. I know he was disappointed. In today’s context, I can’t help but think he was denied the promotion to colonel not because he didn’t deserve it. He didn’t fit the prototypical image of a high-ranking Army officer in 1954 America because he was not brash enough, short of stature at 5’2″ and his skin was a shade too dark. I don’t know how many Brigade commanders sought him as their Executive Officer. He was forever the XO, excellent at managing day-to-day but in the eyes of his superior officers, not good enough to lead. Sound familiar? But he couldn’t fathom that the country he fought and bled for might be capable of discrimination. He didn’t say a single disparaging word. In the view of that generation of immigrant soldiers, America could do no wrong. He was proud of his service to his country — as I am proud of him, as all of us should be. 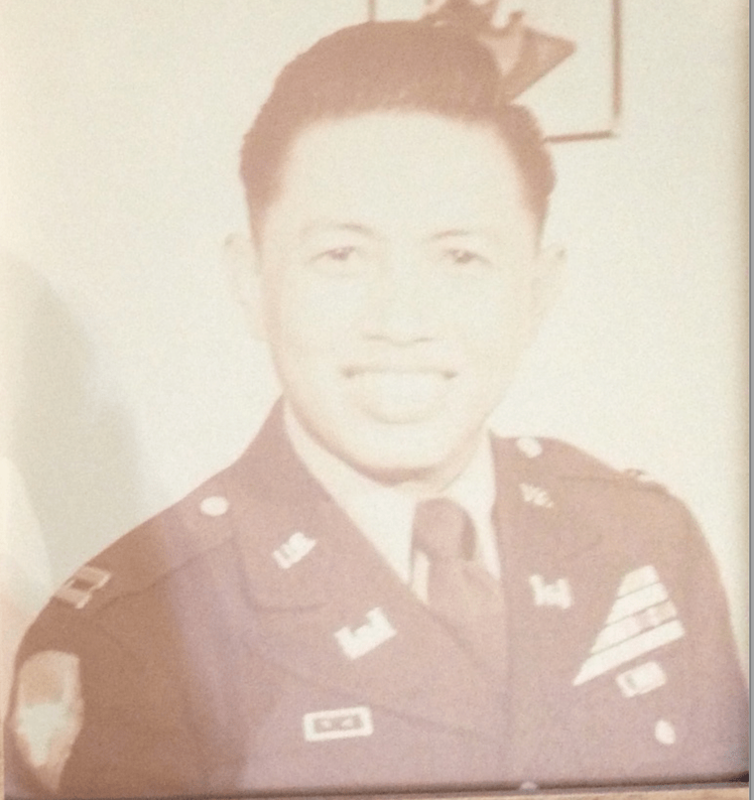 This Memorial Day, don’t forget him and the other Asian American servicemen and women of that first generation who served their adopted country. Ed Diokno writes a blog :Views From The Edge: news and analysis from an Asian American perspective. AsAmNews is an all-volunteer effort of dedicated staff and interns. You can show your support by liking our Facebook page at www.facebook.com/asamnews, following us on Twitter, sharing our stories, interning or joining our staff. Memorial meetings in honor of the memory of Ka. Joe Navidad ( 1948-2016) were held in Los Angeles,California in the United States and different parts of the Philippines last May 28, 2016. The Moro People’s Community Organization for Reform and Empowerment their TRIBUTE to a comrade, friend, colleague, mentor, community organizer, supporter, benefactor, uncle, brother, kasama, and a great man who gratified us, today, May 29, 2016, 3PM @ Albert’s Dinner House, Kabacan North Cotabato along National Highway, Southern Philippines. This event will be simultaneously celebrated with us by Ka Joe Navidad’s family, relatives, comrades and friends in Digos City, Davao Del Sur, Sendong Survivors in Cagayan de Oro City and Yolanda Survivors in Roxas City, Capiz who were beneficiaries of People’s CORE’s cash assistance and relief services through the effort of People’s CORE Executive Director, Ka Joe Navidad. We are also happy to inform everyone that a Public Memorial for Ka Joe R. Navidad was held last May 28, 2016, 12 Noon – 5PM at Japanese American Cultural & Community Center (JACCC) – James Irvine Garden 244 S. San Pedro St., Los Angeles, CA 90012. To be initiated by the People’s CORE staff, family, relatives, friends, Alliance-Philippines,Justice for Filipino American Veterans(JFAV) and KmB, Pro-People Youth Los Angeles members. Ka Joe Navidad, was the Founder and Executive Director of People’s Community Organization for Reform and Empowerment (People’s CORE), who touched our lives and empowered us through Moro People’s CORE. His commitment to help and serve the people with his charisma, passion, humor and wit inspired lots of Muslims and Indigenous People’s in Mindanao in particular and the entire communities local and abroad. We are all proud of you! We love you and you will always be in our hearts! Unending thanks for your unconditional support and commitment to help and serve the people! Moro People’s CORE will never be same again without you but we will always be inspired of your legacies in serving the people and continue the struggle! You’ll always be in our hearts! For more information please contact Bernie at FASGI at (213)497-9804 and Art at (323)640-4056 or email us at alpiegarcia@gmail.com. Also visit our website at www.jfavusa.org for more details. I remember my college professor, who, in our Political Science 101 subject in early 1970s, gave only two kinds of constitutions, or fundamental laws of the land: the written and the unwritten. The British Constitution is a prime example of an unwritten constitution. Its fundamental laws have been products of customs and traditions, which have been handed down from one generation to another generation. The U.S Constitution is a prime example of a written constitution. Its founding fathers saw the necessity to put its fundamental laws in written form. It serves as the ultimate social contract between the governors and the governed. Being a former U.S colony and a young nation in the community of nations, the Philippines adopted a written constitution. The first constitution is the 1935 Constitution. It is called as such because the Filipino people ratified it in 1935. It was the fundamental law that became operational when the Philippines became a Commonwealth, or autonomous, state in 1935 in preparation for self-rule, or independence, ten years later. The 1935 Constitution had remained the fundamental charter after the Philippines has gained independence from the U.S. in 1946. Because of the colonial nature of the 1935 Constitution, the government of Ferdinand Marcos (he was not yet the dictator then), initiated a constitutional convention in 1971 to draft a new constitution that would reflect the republican, not colonial, nature of the Philippines. But Marcos declared martial law in 1972 and manipulated the convention to come out with a constitution that would serve as the blueprint of the martial law government or the Marcos dictatorship. Marcos did everything to manipulate the ratification of the 1973 Constitution. In the Javellana vs. Executive Secretary case, the Supreme Court, then under the respected Chief Justice Roberto Concepcion, ruled that the 1973 Constitution was not properly ratified by the Filipino people under the established norms of ratifying constitutions. In fact, it was declared ratified under fraudulent circumstances. It only became operational when somebody in the Supreme Court inserted the encompassing phrase that the 1973 Constitution had no judicial obstacle to become effective and operational. The 1973 Constitution was amended six times to insert provisions to strengthen the one-man rule of Marcos. Because of those frequent amendments to favor Marcos, wags claimed that a third kind of constitution existed: the frequently rewritten constitution. The 1973 Constitution was totally shelved when the near bloodless 1986 EDSA People Revolution took place and ousted Marcos from power. The Freedom Constitution has been replaced by the present 1987 Constitution, which the Filipino people have ratified on Feb. 7, 1987. This narrative goes to open minded millennials, who have the passion to know our political history. Forget the Marcos loyalists, who possess twisted minds. They will never understand what actually happened in our history. They will even revise our history. What’s noteworthy is, in reaffirming his plan to allow the Marcos family to bury Ferdinand Marcos at the Libingan ng Mga Bayani, even President-elect Duterte is now admitting that the late dictator, considered the second most corrupt ruler in recent history, is no hero. But Duterte sure is choosing to honor the worst kind of Filipino soldier. And in doing so, he’s disrespecting the truly honorable Filipino soldiers, especially those buried at the Libingan ng Mga Bayani. It’s a safe bet many of the soldiers buried there did not make up tall tales about what they did during the war. That’s not the case with Marcos, the most notorious fake hero in Philippine history. That was the famous reaction of former US Army Captain Ray Hunt, who commanded Filipino guerrillas during World War II, when he was told of Marcos’ claims that he was the leader of impressive guerrilla force that wreaked havoc on enemy forces during the war. “Marcos was never the leader of a large guerrilla organization, no way,” Hunt told the New York Times. And there are even questions on which side Marcos’ “paper army” was fighting for. For there’s evidence that Marcos and his alleged guerrillas weren’t even on our side. The U.S. Veterans Administration found that some of the guerrillas who claimed to be members of Marcos’ group became notorious for committing atrocities against Filipino civilians, not fighting the Japanese occupation forces, according to a 1989 UPI report. And Marcos’ men were even found to have engaged in “nefarious activity,” such as selling contraband to the Japanese. That’s the kind of soldier Duterte thinks is worthy of a hero’s burial? And it’s not like the president-elect doesn’t have an idea of heroism. He had one in his family: his mother. Soledad Duterte was a prominent, fearless leader in the movement against the Marcos regime in Davao in the 1980s. That’s the standard of heroism Duterte should follow. I lost two of my loved ones during the darkest days of martial law. I lost countless comrades in the thick of our fight against martial law. Friends, comrades, neighbors. As a historian, I made a list of comrades and during our human rights conference in 1977 in the North, my list was up to 600 persons. That is why I do not believe in the list that more than 30,000 were killed, missing or disappeared during the 14 years of martial law. Its more than that because there was no clear recording of the atrocities of the Marcos martial law years. So we have to contend with what was recorded then. In the Eastern Forest Region of Isabela alone more than 150 barrios were evacuated and more than 50,000 people were affected from 1972 to 1977. This was repeated in Eastern Cagayan from 1980 to 1986, in Western Cagayan,Kalinga and Apayao to Ilocos Norte from 1983-1986. That is why, as a human rights worker and a media person, I cannot understand presumptive President Rodrigo Duterte’s stubborn and dogged decision to bury the dictator in the National Heroes Cemetery. As if Duterte did not know that the Marcoses violated the agreement with President Ramos that they will bury the dictator’s body in Ilocos Norte. That is the reason why FVR let Marcos body be brought back to the Philippines. Well, I understand that politicans are notorious for breaking their words. Maybe Duterte made the promise to the Ilocanos and he is now stubborn to stay true to his word. But he should know better that the north suffered like his brothers Moros in Mindanao. In fact, it was the north that suffer the most as I narrated during martial law. That’s why they remember. Maybe some people will say,”Why then Bongbong won in the Solid North”. It was clear that it was not only Marcos that got their votes but most of all– Duterte. The North remembers and they want change. They were feed up with the insensitive hacendero President for six years. And actually that’s besides the point. And Duterte cannot make it as an argument that Ilocanos wanted him (Ferdinand Marcos) to be buried as a hero. It is wrong for Duterte to make that as an explanation why he is adamant to bury the dictator in the “Libingan ng Mga Bayani.”. He should know that the Ilocanos suffer too during martial law. Actually, they suffered the most and they remember. Let us say, for Christian values, we must bury the dead even they are our enemies. But to honor them as heroes, it is the height of arrogance and wrong expenditure of political capital for Digong Duterte. His action speaks louder and displays what values he holds dear. And human rights and freedom is not one of them on this case. I personally who lost two of my loved one and countless comrades and friends, cannot take nor will never understand his actions. You are no different from other Philippine Presidents of the past who will bulldoze their ways among the people. And on this case, if you will bury the dictator among the heroes of the people, I will never forgive you nor forget what you did to insult the memories of those thousands who died for freedom. To Digong Duterte, be warned; “THE NORTH REMEMBERS! My grandfather, Judge Ireneo Escandor, was imprisoned, leaving my grandmother, Lola Celing, to raise eight children. They suffered deep hardship, and endured separation from their father. And you tell us it is just a matter of “distributing the award”. Real people sacrificed life and limb, not to amass cash (how absurd! ), but to bring down a tyrant, a plunderer, a murderer. Both grandfather and granduncle now lie in a humble, marked grave in the small town of Gubat, Sorsogon. They died for country, without a hero’s burial, no marching band, no flag on the casket. There are thousands of them, Mr. president-elect, who died maimed and tied and tortured, in graves marked and unmarked, but they are the fortunate ones because at least their families had a body to bury. Yolanda Gordula, the person Dr. Johnny was with on March 30 right before he was “salvaged”, was never found. There are immense moral and historical consequences to burying Marcos as a hero. The matter is certainly not confined to narrow legalese, not a matter of just “going to court” as you suggest. If Marcos is buried a hero, what do we make of those who fought his tyranny? Are they now the anti-hero? We have always said that there is something deeply wrong with a people who cannot remember their history or their real heroes, who are happy with the short-sightedness of a sanitized “peace/healing” rather than one that is based on justice. I could go on and on about the woeful tragedy of forgetting. But the greatest tragedy is that those who do not remember are bound to make the same mistakes. No wonder then that too many of us, when confronted with another murder, plunderer, tyrant and all their configurations, are confounded by the discovery; when confronted with the destructive dismantling of democracy, are at a loss, not knowing what to say or do or make of it; when confronted with the spreading canopy of aggression and dispossession, are happy with the little spoils from the Master’s table, are quick to trade their freedom for quietude, humanity for comfort, justice for convenience, motherland for self-gain. They have no insight from the struggles of past, and have no collective narrative to moor them to the fate of the larger society. How many deaths, Mr. president-elect, before we treat a murderer like a murderer? How many billions of national wealth siphoned to offshore accounts before we call a plunderer a plunderer? How many years lost, families separated, people detained and disappeared, lives snuffed out before we call a tyrant a tyrant? How many, Mr. president-elect? I was truly hopeful when, at the presidential debates, you did not mince words about the disposession of the Lumads, the Moros; the impoverishment of Mindanao; the inequities induced by “imperial Manila”. You, of all people, should know what justice means, what historical wrong is. So to your question: “Anong gusto niyo? You want the Marcos cadaver to be burned? Will that satisfy your hate?” my answer is, it was never about hate at all, it is about JUSTICE.